Five Favorite Style Moments: What Are Yours? Short sassy hair and some lace. Several of my style moments involve wearing a piece of lace in some form. Not head to toe, but I love a lace blouse over a tank top. And how cute is my girl Skinny G, getting ready to tear up a rug. I miss those loose linen trousers, and need to find a pair for this summer. Animals and etc. on my tops. 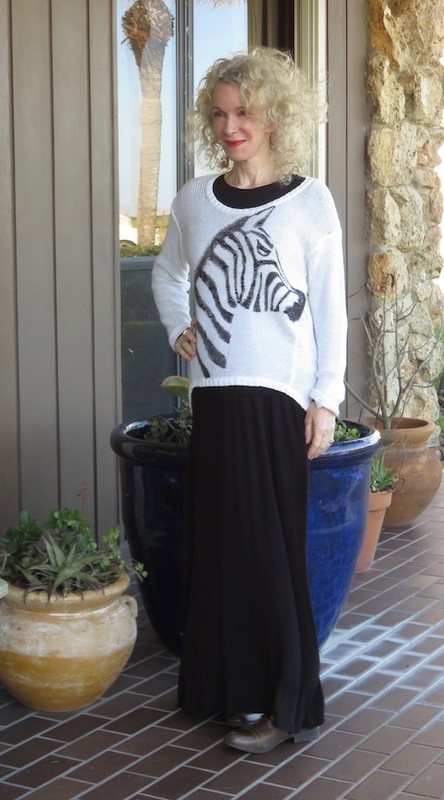 My brilliant friend Suzanne Carillo painted this zebra on a white sweater! How cool is that. The zebra even looks like she has attitude. Graphic tops, especially with animals, are one of my signature styles. You can look perfectly well dressed, and slip a little personality in. Go edgy in the big city. Here’s another style moment: a typical downtown NYC outfit in leather and jeans and tie-up boots. It’s really easy to dress in a NYC “uniform” as I already love dark neutrals and boyfriend jeans. 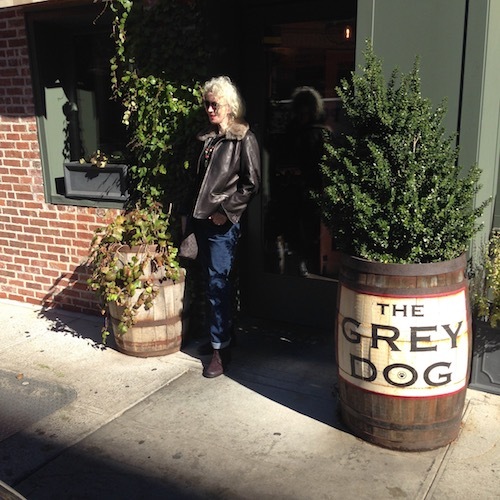 See you soon, Grey Dog. When I’m not being all dark neutral, I like to let my bold floral side out. 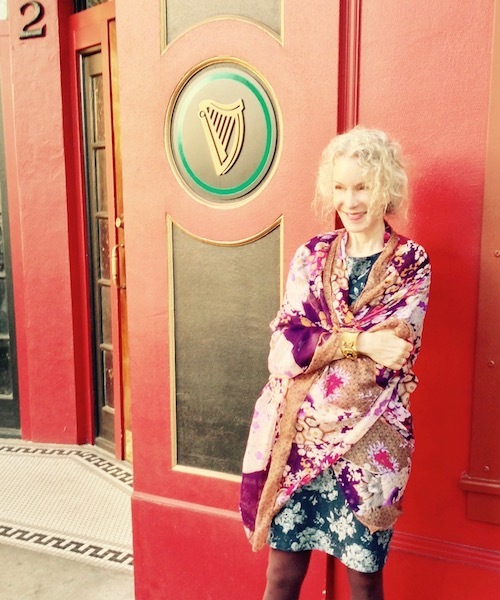 I love this look that Sandy snapped in a candid moment, outside our favorite pub. A big floral scarf makes a stylish topper, even over a floral dress. Feeling groovy. The Blue Wall Rules. 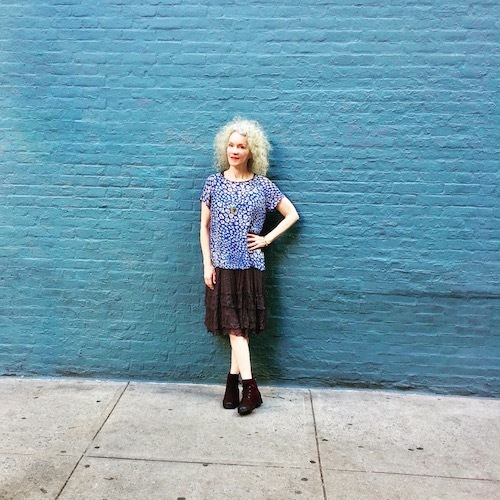 Starting about six years ago, we’ve been taking pics in front of the blue wall on Minetta Lane, in the heart of the Village. This is one of my favorite looks, an easy and loose top over a lacy dress, toughened up with boots. Our new wee studio apartment is just around the corner from the Blue Wall! Please be aware that links to vendors may be affiliate links. I do benefit from your purchases through the links on the blog. Header image here. You always look great and when I am admiring your style I think to myself, why is it that I always admire the style of someone whose body is so very different from mine and what should I do about that? That is one of the benefits of having blogged for several years – there is a whole archive of outfit shots from the past. When I have gone back for a look I have a lot of “ohhhhh, I loved that outfit! !” and “omg, I look so young” moments. You have wonderful style Patti. I like the way you stay true to what you love and that your look is timeless! Literally the PERFECT formula for coming up with a great outfit every single time! Gorgeous style moments! I especially love the first one – with your happy laugh and your pretty kitty! But all of them are 100% uniquely and authentic You! I know what you mean by the archive of photos, loads of them. Some of them make me scratch my head – what I was thinking? And others I love and think I’ve actually learned something in these few years of blogging. I think my blue floral coat is one of my fave (recent post), but I do love many of them, depending on my mood. lovely lace, edgy style, florals, lovely attitude! Lovely You! Indeed you did capture so many beautiful moments here. My favorite of these locks is the photo of you wearing that layered lace. That is because your smile is so warm and engaging. I love your bold floral look as well. How fabulous that you live next to that blue wall. The perfect backdrop just around the corner! Love you in the short hair and that Edgy outfit is just Badass. . . Kudos!